Cette publication est reliée Stevens, C W; Kerr, D E; Wolfe, S A; Eagles, S; (2015). Predictive surficial geology, Yellowknife and Hearne Lake, Northwest Territories, NTS 85-J and NTS 85-I, Commission géologique du Canada, Carte géoscientifique du Canada no. 200, éd. prelim. Surficial materials and surficial geology maps provide important geoscience information required for geological reconstructions, mineral exploration and development, and land use planning in northern Canada. In this study, remote predictive mapping was used to derive predictive surficial materials and surficial geology maps for Hearne Lake NTS 85-I, located within the Slave Geological Province. The predictive maps were generated using radiometrically balanced LANDSAT 7 imagery and knowledge gained from airphoto interpretations, field observations and legacy datasets. This Open File contains graphical and digital georeferenced versions of the predictive maps. 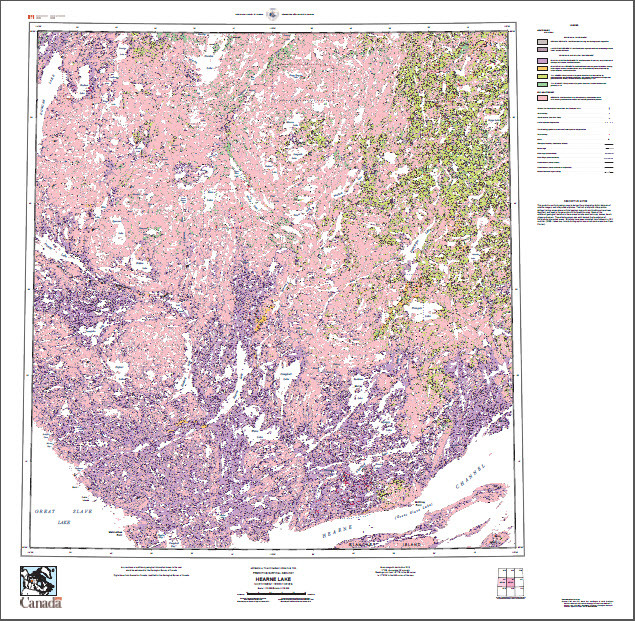 A printable version of the predictive surficial geology map is provided in pdf format (map scale 1:125 000).